One of the first areas that I start with when decorating my home for Fall is my front porch. The front porch provides a welcoming entrance into our home, and also creates a festive display from the street for passersby. It’s a great place to add a little color and celebrate the season by decorating it in Fall colors of orange, yellow and green. To start, I like to add a mixture of colorful chrysanthemums (mums for short) in various sizes. These colorful, Fall flowers come in yellow, white, dark plum, lavender, orange and red, so you can find a color that coordinates with your front porch. The bonus for mums is that they are a perennial plant. Once they have graced your front door, you can plant them in a sunny spot and they will bloom for years to come. Another colorful perennial plant that many garden centers offer in Fall includes the aster, which comes in similar colors, but usually purple, pink and a yellowy white. These mums were on my porch in a previous season. Now they are a feature in my front yard. I usually wait to find a good deal at my local garden center on my mums, and depending on what I find, I create my display. Early in the Fall, the better deals were on the mini mums ($1 at Walmart) and around $3.50 for the medium sized ones. Because of this, I decided to make several smaller arrangements out of the small ones and transplanted three of the small ones into a bigger box planter. 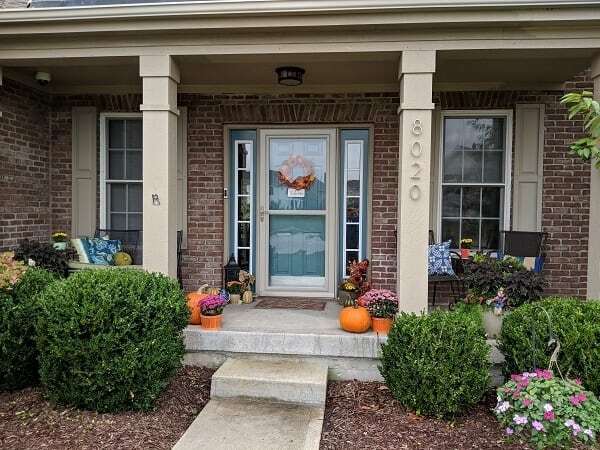 I also purchased two pumpkins to flank both sides of the stairs leading up to our front porch and included two medium-sized mums on either side. (I found the orange buckets for my mums at Target’s Dollar Spot section for $3). Since I know that since the weather will be warm off and on in September, these pumpkins will likely rot and will have to be thrown out soon. But for the cost of a Starbucks café latte, I’m willing to sacrifice for the sake of having pumpkins in Fall! These real pumpkins were purchased at Walmart for around $4 each. Alternatively, many pumpkin patches will also grow fresh pumpkins for purchase. Or, if you don’t want to mess with real pumpkins, you could purchase some faux ones. Usually, I prefer the look of an orange pumpkin, but the colors are endless when you use faux pumpkins. White and neutral greens are popular colors now. Leading into my front door area, I added two displays on either side of my door for some visual interest. For these displays, I used a couple of lanterns that I had on hand, some faux pumpkins, and some artificial greenery and garland in Fall colors. Because I recently painted my front door blue, and had a colorful Fall welcome mat, I chose colors of greens and blues. In addition, I added some multi-colored mums to bring out the colors of the mat. Some of the items were ones that I already had on hand. I found the two green, jeweled pumpkins on the left at Bed, Bath and Beyond. On the right, I found the faux plastic pumpkins in muted orange and green colors at my local Kroger grocery store. The faux greenery was actually purchased from a garage sale. It goes to show that when decorating my home for Fall, I didn't need to spend a lot of money to put together a festive Autumn display! A close-up shows the green, blue and yellow accents in the mums, pumpkins and lanterns. For decorating the two seating areas of my porch, I used small pots that I already had to transplant two more mini mums and placed them on side tables. I kept my existing blue and green throw pillows and just added a mini fabric pumpkin from Lowes to the glider bench seat. This adds just a little bit of Fall to the area. I’m still on the lookout for a Fall throw or possibly some different throw pillows to add a punch of Fall to the seating areas! But for now, they look fine against the orange I have already added here. As you look at my front door, you’ll notice my colorful Fall wreath. A front door wreath is a must when decorating my home for Fall. This was a DIY project this year, made from items costing $1 or less. The total cost of my front door wreath was $12, and it took me only 30 minutes (not including shopping time). Check out my post about how I created my DIY Fall Wreath. My front door for Fall - looking into my entryway, and my DIY Fall wreath. 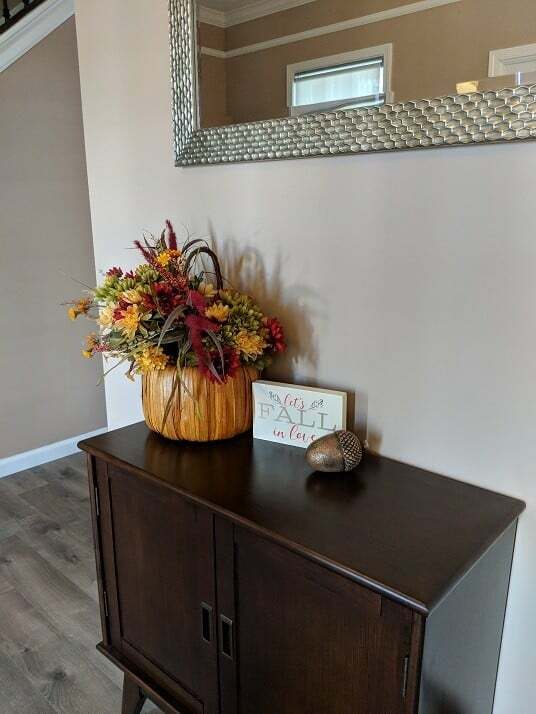 My entry table showcases a floral arrangement I created from a pumpkin basket and colorful, Fall flowers. This arrangement anchors the table. While decorating in a grouping of three, I’ve kept this table simple by adding a ‘Let's Fall in Love’ sign and a metal acorn to complete the styled table. Next, it was time to add a festive touch to my dining room table for Fall. Here, I’ve created a tablescape using faux sunflowers and marigolds from my garden. First, I started with my blue table runner to match my decor. Then, I scattered faux burlap leaves and mini yellow pumpkins alongside a few sunflower dishes and flowers. Finally, I created my centerpiece, which is a hand-crafted sunflower pom pom ball in lieu of a traditional flower arrangement. I will normally change this table décor twice during the season: Once more for Halloween and once for Thanksgiving. In my kitchen, I don’t have a lot of space to decorate, due to all of the appliances and general household clutter. However, I do like to add touches of Fall here and there. One place I did that was my kitchen island, where I created a styled, tiered tray in my home’s colors of aqua and brown. This was a simple project I created for under $10. I crafted it using a painted Dollar Tree candlestick and two Better Homes and Gardens plates of various sizes from Walmart. Once they were complete, I styled them with mini brown and white pumpkins, a gold owl and other touches of Fall such as decorative acorns. I will blog about this styled tray DIY in a future post. My styled Fall tray was created using two plates and a brown, spray painted candlestick. When you visit my home in Fall, you will notice several pumpkin displays and vignettes throughout my home. I always try to find pumpkins of all sizes in colors that match my home’s décor. For instance, in my bedroom, I decorated my aqua and black master bedroom with (you guessed it) black and teal pumpkins. This bedroom side table features a black and white fabric pumpkin, ceramic blue pumpkin and a fun Fall saying on a black and white letterboard. For my fireplace mantel, I created two vignettes on either side and filled them with candles, pumpkins and floral pieces to match with my fireplace and family room decor, which is teal and brown. The gold accents give the room some glamour. This Fall mantel features pale pink sedum from my garden, faux florals, candles and pumpkins in tones of brown, white and gold to coordinate with my family room decor. My pale gray-blue powder room even received a treatment. However, I didn’t have pale blue pumpkins. Instead, I went with brown, a coordinating color. I placed some brown and white pumpkins and candles in the space to keep it simple. For a monochromatic look, I went with brown Fall pumpkins, candles and a hand towel to coordinate with my gray-blue powder room. When I decorate my home for Fall, it’s all about first using what I have and dispersing it throughout the house. Then, when I am out shopping, I may find something that's a perfect fit for my décor. Or perhaps I'll find simply something that I love, and I will add it to the mix. I am constantly changing and re-arranging items to fit my space until it feels right. There’s no right or wrong answer to decorating, and you don’t have to spend a fortune on Fall décor. Most of the items I decorate with for Fall are no more than $10 or $15 each. Some items were thrifted or purchased for $1 or less, and others were created using found items. I hope that my mini home tour has inspired you as you see how I have been decorating my home for Fall. Let me know in the comments below if you were inspired by something you saw on my home tour! Great tour! Love your front porch and all the pumpkin pops throughout the house! Your home is beautiful!! All the fall touches are just perfect!!! Susan, I am in love with your front door color and all your fall touches and tips. I am enjoying being connected with you. Lovely home! Hi Susan! I am so happy to be on this Tour with you! The front of your house looks beautiful! I love all the fall touches throughout your home. I especially love the basket display in your entryway! Love seeing all the lovely fall touches you have around your home. Thanks for sharing! You have a very pretty home! Great home tour? Susan, I love all your touches for Fall. Great job! I especially like the front porch. So welcoming and perfect for Fall! Happy to be on this blog hop with you! Nice job decorating our front porch! I make sure your handy work is seen day or night by automating the front porch light. Anyone can learn how to create a porch light timer on my blog if they are interested.